The Toyota Sienna minivan stands alone: It’s the only minivan available with all-wheel drive. This year it expands its monopoly by adding the AWD option to the Sienna SE. Updated last year, the 2019 Sienna gets no mechanical or styling changes, but its infotainment has been upgraded for 2019 with Apple CarPlay and Amazon Alexa capability. The 2019 Sienna is powered by a 3.5-liter V-6 making 296 horsepower, mated to an 8-speed automatic transmission. It’s front-wheel drive, with all-wheel drive available in every model but the base L. It’s available as a seven-seater or eight-seater. The EPA rates the Sienna at 19 mpg city, 27 highway, and 22 combined with front-wheel-drive models, or 18/24/20 mpg with all-wheel drive. Active safety equipment includes adaptive cruise control, active lane control, forward-collision warnings with automatic emergency braking, and automatic high-beam headlights on every model, including the L.
The NHTSA gives the Sienna five stars overall, with four stars for side impact and four stars for rollover. The 2019 Toyota Sienna comes in five models: L, LE, XLE, SE, and Limited. Even the L comes with a 6.1-inch infotainment system with Apple CarPlay and Amazon Alexa, and five USB charging ports, as well as those active safety features. The most popular model is the LE, which adds dual power sliding doors, a power driver’s seat, and special stain-resistant cloth upholstery. The XLE adds leather, a power moonroof, and a power front passenger seat, while the Limited adds a power-folding third-row bench and a loudspeaker that sends the driver’s voice to the third row. Our guess is that it was designed by a frustrated parent. The SE has a firmer suspension, sporty exterior trim, and its own interior. An optional rear seat infotainment system offers wireless streaming for Android devices. The 2019 Sienna hasn’t changed much, and still has the distinctive front-end appearance it’s worn since 2011. It looks more wedgy than some of its minivan rivals. The SE model adds side skirts and has unique bumpers, as well as clear taillights and larger wheels at 18 inches. The Sienna’s sweeping dashboard incorporates a standard 6.1-inch touchscreen for infotainment, while upscale models have a 4.2-inch screen in the gauge cluster. The Limited gets reclining second-row seats with leg cushion extenders and foot rests. With its 119.3-inch wheelbase and 200-inch overall length, there’s 164.4 cubic feet of passenger space inside, enough for eight occupants or seven with the optional second-row captain’s chairs. The third row, remarkably, can fit three adults. Not only that, it’s easy to reach, even easier with captain’s chairs. Behind the third row there’s a massive 39 cubic feet of space, and the third row folds flat to open up 118 cubic feet of room. With the second row out, there are 150 cubic feet, and with both rear rows of seats removed or folded away, the 2019 Sienna will carry a stack of plywood. Unfortunately the middle row of seats doesn’t stow in the vehicle floor, only in the garage. The 3.5-liter V-6 is proven, and the acceleration is decent with a solid 296 horsepower mated to an 8-speed automatic transmission and either front- or all-wheel drive. The engine is stalwart and the shifting is smooth, if a bit hesitant to downshift for a burst of speed. The steering is light but accurate. The thick steering wheel suggests sporty handling, but that isn’t the case. It’s a minivan, after all, and it puts predictable road manners at the top of its to-do list. The ride is comfortable, better on this year’s 18-inch wheels than last year’s 19-inchers. The firmer suspension on the SE doesn’t degrade the ride too much; most drivers won’t even notice the sporty intent. 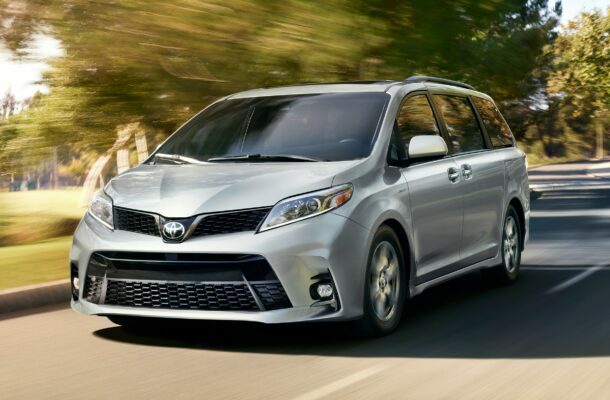 If you need an all-wheel-drive minivan, look no further than the 2019 Toyota Sienna. You’ll be satisfied with the powertrain and pleased by the cargo space behind each row. Adults will actually be able to use the third row. The standard active safety equipment puts the final touches on a convincing package.